WHEREAS, the governing body finds it necessary and proper to create and adopt a Trail Master Plan for the trails located within and flowing out of the City of Goodland. SECTION 1. 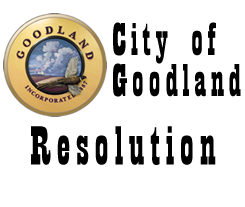 That the City of Goodland hereby adopts the 2018 Trail Master Plan as the official planning guide for the Goodland, Kansas trail system. PASSED AND ADOPED this 16th day of July, 2018 by the Governing Body of the City of Goodland, Kansas.